I remember rushing into the store in early 2002 and buying Jennifer Knapp's cd titled, "The Way I Am." Eagerly opening the wrapping and carefully placing the cd into my cd player, I listened to it on repeat for hours while in the car. The notes she played planted a seed in me and I began dreaming singing and playing songs as real as she did. I wanted to write and sing words that were full of meaning, value, hope, and freedom. 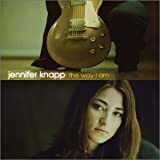 Although Jennifer Knapp has been absent from the music scene a few years, she still lives on through all the girls she has inspired to pick up a guitar and learn to express themselves through music.